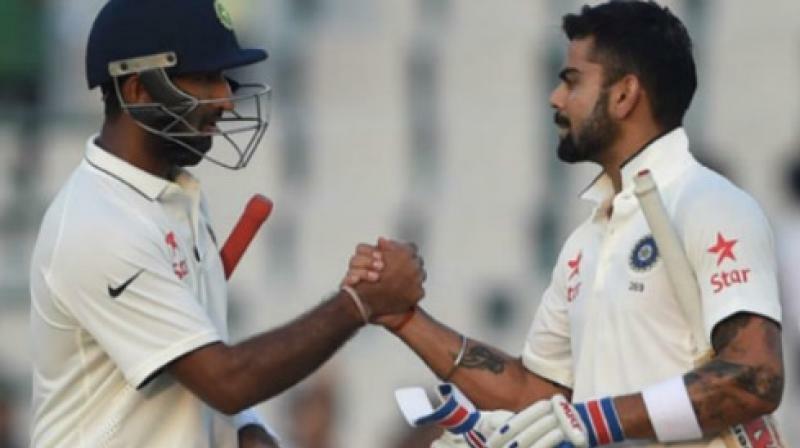 Virat Kohli was all praise for Cheteshwar Pujara after his back to back tons in the on-going test series against Sri Lanka. According to Virat, Pujara’s efforts are more commendable because he is not someone who is in the Indian squad for limited-over Cricket. So when the team plays 50-over and 20-over Cricket, he has to be out of action, but, he doesn’t relax during that gap and ensures that he keeps himself in great batting rhythm all the time. Most of the batsmen, when they return to the international level after a gap, can’t quite find the middle of the bat straightaway, but, Pujara is really an exception. It doesn’t take him any time at all to start middling the balls. He delivers from the word go, regardless of how big a gap he has had between the two games, and that shows that he bats a lot even when he is not in the scenes which is why his timing and everything remains spot on. If India wins the next test match as well, it will be a special feat because it will mean that India will secure a whitewash in a test series in the away conditions and that’s not something which has been common in Indian Cricket over the years. They have always been regarded as a team which is more dominant at home than away. On asked how special the whitewash would be in overseas conditions, Virat says that the whitewash, if it happens, would indeed be great, but, he wouldn’t go too much into this overseas thing because he doesn’t see the overseas games in a different light. He just looks to win and doesn’t think much about the conditions being overseas or whatever. His team has the ability to come out victorious in any conditions.